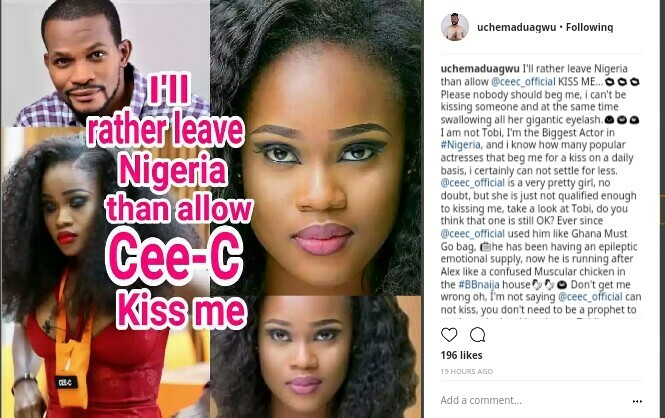 Just when we thought we've heard it all from controversial nollywood actor, Uche Maduagwu , the controversial actor has spilled another tea again on our very own BBNaija housemate, CeeC. According to him, he said he would rather leave Nigeria than allow CeeC lock lips with him in a post he shared on his Instagram page. Recall that all of this claims is coming after he shared a recent post and bragged about even if he's offered 10 million naira that he can never marry CeeC.